I met Barb Mortell in the early 2000's through a mutual friend. In fact she was working at the fabric shop where I saw Amy Butler's first line of fabric! (You know the day everything changed!) Last Sunday I took my third workshop with Barb through the Vancouver Modern Quilt Guild @vancouvermqg. You might know Barb or you might know her and not even know it. She was in Sherri Lynn Wood's book The Improv Handbook for Modern Quilters: A Guild to Creating, Quilting & Living Courageously. Barb's quilt is on page 38. The workshop was appropriately titled Door Jam, based off a quilt of Barb's with the same name. 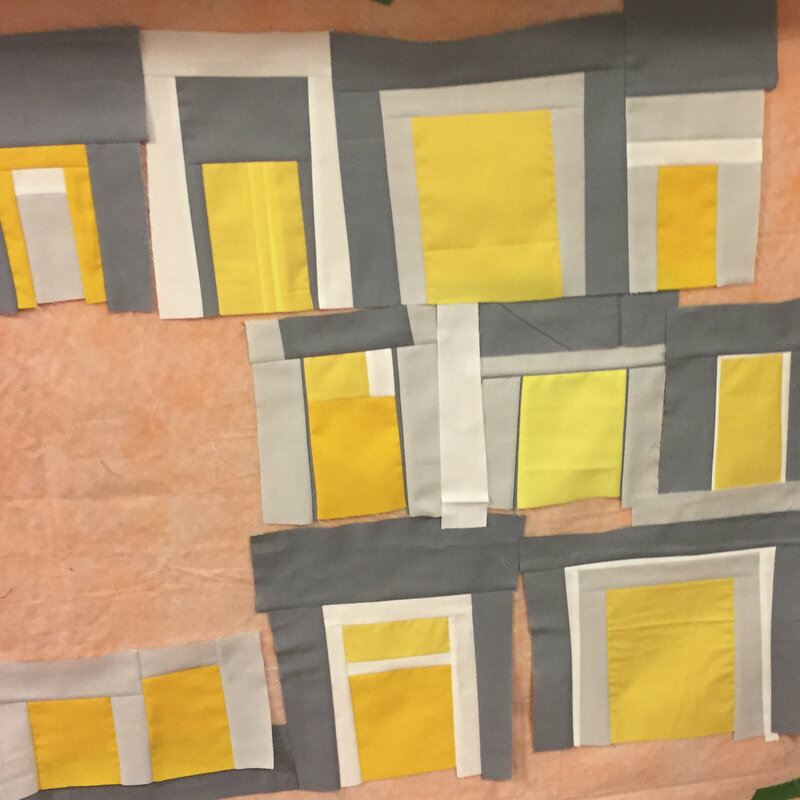 Her inspiration for the quilt came when she was walking her dog around her neighborhood and noticed some beautiful yellow doors on grey houses. 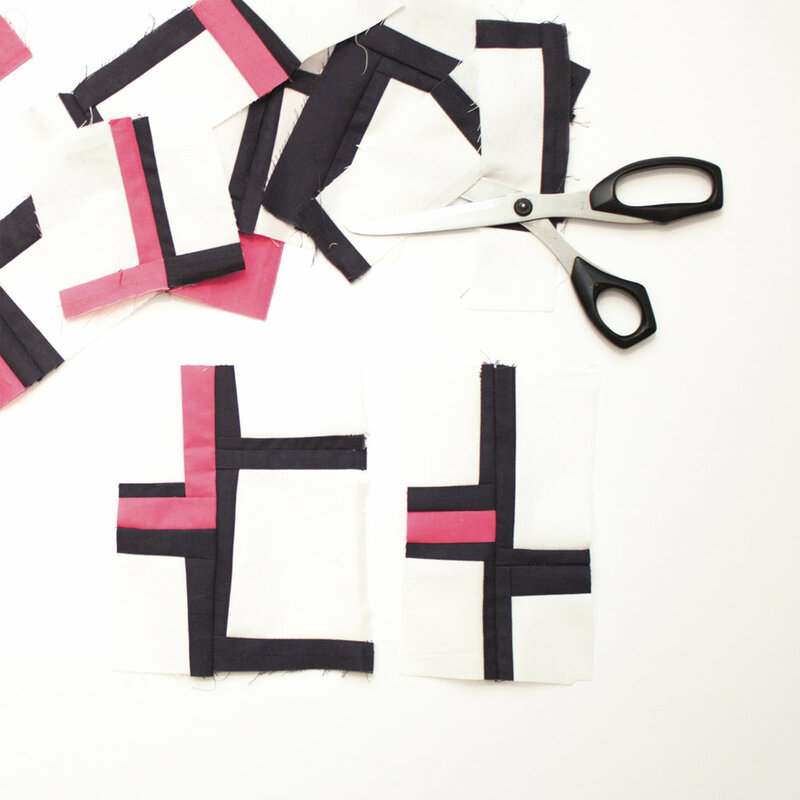 Volia, a quilt and a workshop was born. 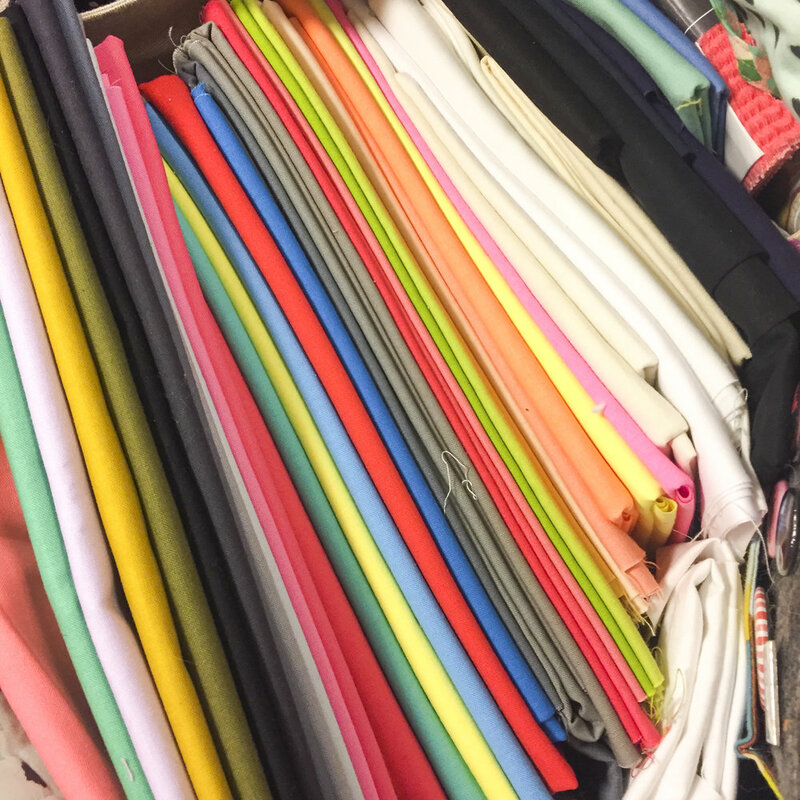 I brought ALL my fabric (when it comes to bringing fabric somewhere, dare I say, I'm never under prepared)... to only use three colours: black, white and pink. I was blown away by people's projects! @kristenandrews tiny green lines on a navy background made me swoon. @sherrichalke also made sun shiny doors and @dinkydoo, aka Alicia, got the most done. I just loved her doors! I, however, sewed, changed my mind, ripped apart my block, sewed it together again, ripped it apart, cut it and I'm still playing with the layout. I did end up with one block I liked but it's only 3"x 5"! And people say paper piecing is hard!!! Improv is the ultimate puzzle! While I haven't finished my block, Barb has a way of saying the right thing at the right time. She's very wise and I'll continue to take as many classes as I can from her. And guess what?! You can too. Barb has started on a new adventure called ARTLEAP! She has classes that go even beyond quilting! But if quilting is your jam and I'm guessing it is if you're here please have a peek at what she's up to by clicking HERE. RECOMMEND PATTERN: Valentine's DAY!!! 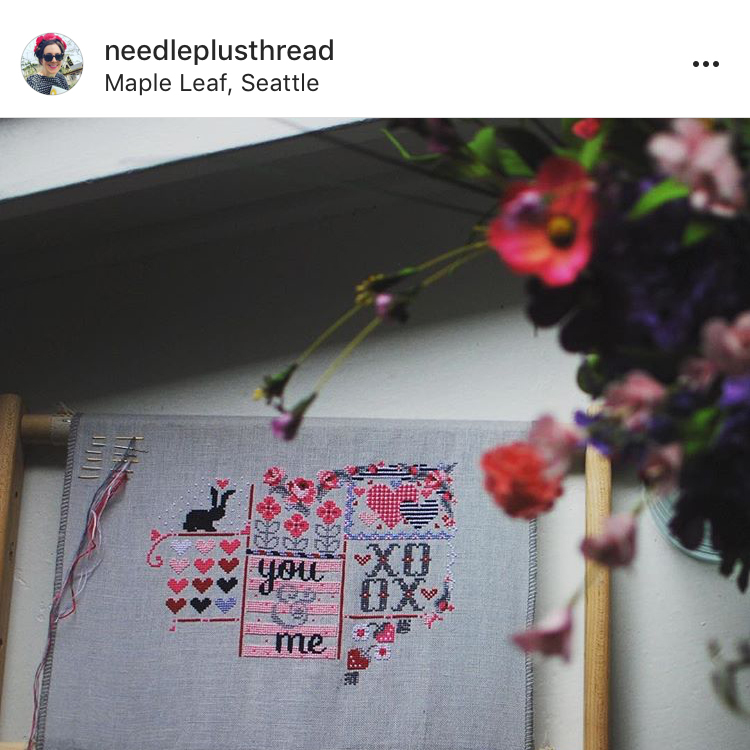 I'm completely jazzed about Kam's @needleplusthread new cross-stitch pattern. Oh my gosh, she's crazy talented. AND if you head over pronto you still have time to enter and win it! Click HERE to enter. RECOMMENDED NEWSLETTER: Abby Hersey! Check out her candy heart FREE pattern and her Galentine's Day FREE Downloadable cards. Find them HERE. I subscribe to her newsletter and I love it. She's my kind of gal! Okay and it's that time... RECOMMENDED FOR YOUR PLAYLIST: I love you by SAID THE WHALE... sing it with me!... "you know, you know, you know, love you!"